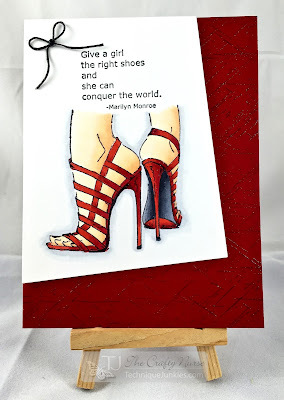 It's The Crafty Nurse here with a clean and simple card share for you using the gorgeous Technique Junkies stamp called "The Right Shoes #SD610." I colored them with Copic Markers in R05, R27, R46, which is one of my favorite red combinations. The bottom of the shoes are C3, C5, and C7 and the skin colors are E50, E51, and E21. The background was stamped with Versamark and heat embossed with clear powder using "Faint Scratches #SD518." This background stamp is perfect for so many design types and I find myself reaching for it often to add great texture. The Right Shoes stamp is so striking on it's own I wanted to showcase it with a clean design. The angle piece was cut using My Favorite Things Blueprint #15 die and I finished off the card with waxed linen bow. Thanks for stopping by the Design Junkies Blog today and I hope you are finding some time to get inky.